An incomparable culinary treasury: the definitive guide to French cooking for the way we live now, from the man the Gault Millau guide has proclaimed «Chef of the Century.» Joël Robuchon’s restaurant empire stretches from Paris to New York, Las Vegas to Tokyo, London to Hong Kong. He holds more Michelin stars than any other chef. Now this great master gives us his supremely authoritative renditions of virtually the entire French culinary repertoire, adapted for the home cook and the contemporary palate. Here are more than 800 precise, easy-to-follow, step-by-step recipes, including Robuchon’s updated versions of great classics–Pot-au-Feu, Sole Meunière, Cherry Custard Tart–as well as dozens of less well-known but equally scrumptious salads, roasts, gratins, and stews. Here, too, are a surprising variety of regional specialties (star turns like Aristide Couteaux’s variation on Hare Royale) and such essential favorites as scrambled eggs. Emphasizing quality ingredients and the brilliant but simple marriage of candid flavors–the genius for which he is rightly celebrated–Robuchon encourages the beginner with jargon-free, impeccable instructions in technique, while offering the practiced cook exciting paths for experimentation. 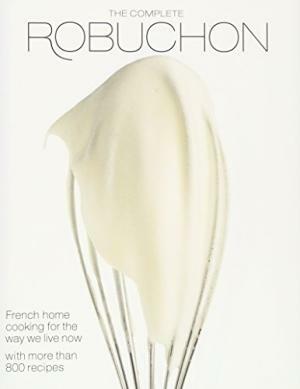 The Complete Robuchon is a book to be consulted again and again, a magnificent resource no kitchen should be without.